When Samuel dies in a car crash, an unidentified writer goes in search of the truth behind his death by interviewing his friends and family. Was Samuel’s death an accident or was it suicide? We are given Samuel’s story through the writer’s interviews with Samuel’s mother, his roommate, his childhood friend and his girlfriend as they flash backwards and forwards through time. The mother was a flighty character who was very uncooperative and did very little to forward Samuel’s story. The roommate, Vandad is an ex-thug who decided to get an honest job once he became friends with Samuel. The childhood friend, Panther is a wild-child bohemian artist. The girlfriend, Laide is a very unlikeable and pretentious Swedish-Arabic interpreter and activist, whose only redeeming quality is that she tries to help abused women. Each of the characters reveal more about Samuel from their own selfish perspectives, making it seem very unlikely that we will ever know the real Samuel. 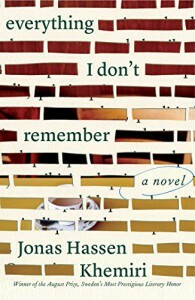 Everything I Don’t Remember is billed as a murder mystery in the book blurb. It really doesn’t hit the mark. I would say it simply falls under literary fiction. It’s a rather bland tale that seems to have been turned into a puzzle for some unknown reason. The unveiling at the end was more about the writer himself than Samuel. I wasn’t invested in the writer so that mattered very little to me. Perhaps it was the very ordinariness of the characters that made this such a highly rated book. I didn’t care for or about any of them. In this case I’m convinced that it was the structural style, the political activism element and the subject of abused women that made this the winner of the August Prize in Sweden. Personally, I wasn’t satisfied with this book. It left me feeling like there should have been more to it. However, this wouldn’t be the first time I haven’t cared for a highly rated book (i.e. Gone Girl really gave me the heebie-jeebies). If you want to read something that has an unusual narrative structure, this may be a good read for you. I want to thank the publisher (Atria Book) for providing me with the ARC through NetGalley for an honest review.